Finding Species was founded on the photographic body of work documenting the countless species in Yasuní Biosphere Reserve. Located in the Ecuadorian Amazon, Yasuní is known to be the most biodiverse place on Earth (Global Conservation Significance of Ecuador’s Yasuní National Park published in PlosOne). More trees grow in a single hectare (2.47 acres) of upland rainforest in Yasuní —655 species—than in the continental US and Canada combined. In 25 hectares, the number of tree species rises to 1,100. "In just one hectare in Yasuní, there are more tree, shrub, and liana (woody vines) species than anywhere else in the world," explains Gorky Villa. It is therefore not surprising that with impeccable academic and educational quality as well as an attractive and efficient design, it is highly prized when identifying trees in the most biodiverse place on Earth. The inclusion of ecological and cultural information gathered in the field with the indigenous inhabitants of the area, the Huaorani, is an aspect that places this book above many others in its genre. Botanists, photographers, and Huaorani collaborated to find, identify, photograph, press, and document this first volume of trees. The result is a rich blend of knowledge of two worlds of Western science and the indigenous Huaorani. 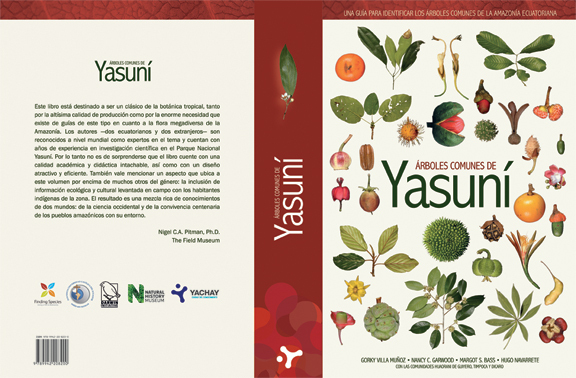 The Common Trees of Yasuní classifies trees simply by leaf structure providing an easy to use field guide in a complex environment. It was released in 2016 in Spanish and in 2017 the English version was released as hard bound book. We have released an eBook version in English with Spanish version coming soon. Additional volumes are being developed and are in search of donors to complete further volumes, available only as an eBook. Please contact Finding Species for more information.